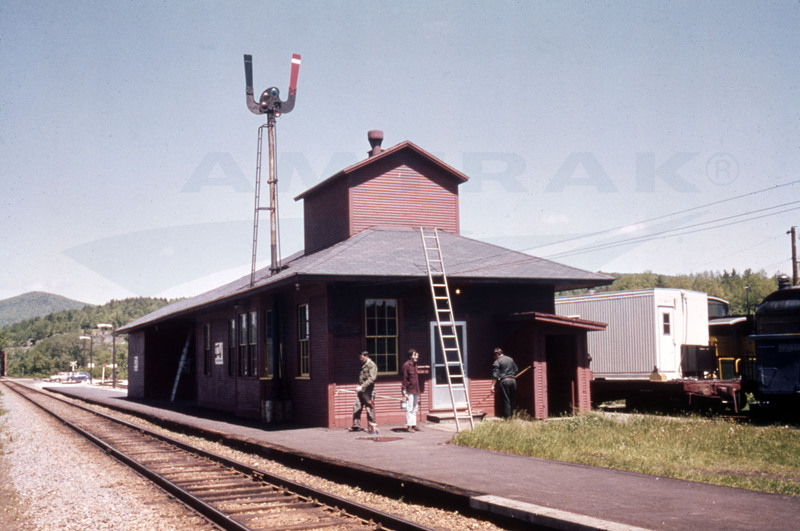 Home > Archives > Montpelier, Vt., depot, c. 1980s. At the time this image was captured, probably in the 1980s, the Montpelier station was served by the overnight Montrealer (Montreal-Washington). On April 1, 1995, it was replaced with the state-supported, daytime Vermonter, which ends its northbound journey at St. Albans. The Montpelier depot, built by the Central Vermont Railway, is a wooden structure dating from the early 1930s. The waiting area includes a windowed bay that extends into the platform area; it allowed the station master an unobstructed view down the tracks. There has been a station at Montpelier Junction since the 1860s, and documentation shows that the current building is similar to its predecessors. Interestingly, in this image the depot includes a semaphore signal.